Vinition caters to the needs of the upper middle class consumers with high quality and complete range of towels. Vinition Home is a brand extension of Vinition. Vinition Home meets personal and household customer satisfaction. Irojei is the preferred brand for babies and kids. Materials are carefully selected material for the comfort of baby and kids. Pilib specialized in boy and man apparel. A “born-in-Malaysia” product anchored upon quality and finishing. Jessica specialized in girl and lady apparel. A “born-in-Malaysia” product anchored upon quality and finishing. World of Towel is a price competition brand catering to consumers seeking for good value products. 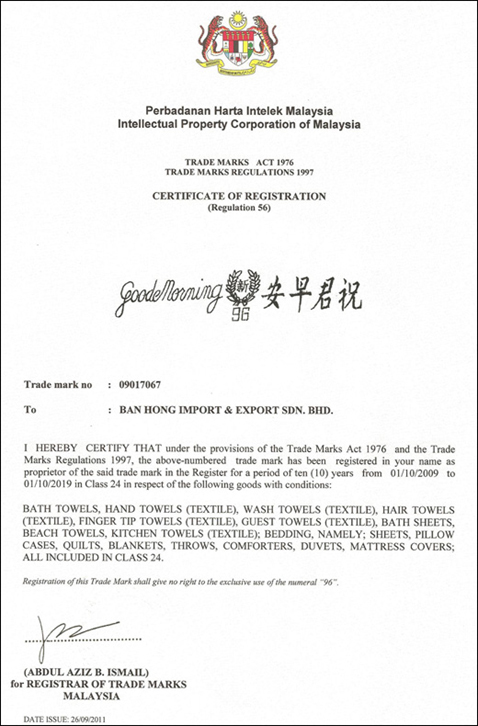 Good Morning Towel is the time-honored brand serving consumers for half a century.